Part Deux of our Fall Fest of Booze Buys is the Rums…and I will confess that my tastes in Rum are far more picky and irrational than any other category. My FaceBook pal, Jamaican-based British Rum authority, Bob Davies, “The Rumelier“, would probably hang his head and cry hearing my preferences in his beloved cane-based nectars but his goals and mine are a bit different. Bob focuses on nothing but Rum and is actively involved in moving the evolution of it forward while preserving the great traditions of the style. Mine are…that I like to drink Rum. Bob contributes to the world’s knowledge base. I empty glasses, so if you want to learn about Rum, follow any link to Bob. If you just want a good, inexpensive thing to sip or mix, read on. What arrived in the Rums was a mixed bag, including one fruit-infused bottle that was waaaay too sweet for me but is included, anyway, just because it turns out to be a killer addition to all sorts of cocktails. Rum was, by far, the smallest category of spirits I received and I hope to make this a lot more informative next year. Rum from other countries around the Caribbean is sometimes called “Ron”, the Spanish spelling of the term, which also helps distinguish it from the Rums produced in the Caribbean, by far the most prominent Rum-producing region. But all these countries, especially The Dominican Republic, birthplace of South Bay, have fine Rum traditions and some of the stuff is nothing short of revelatory. South Bay’s Small Batch No. 18 is what I have always hoped Rum would taste like. I’ve now “tasted” it about ten times and it just keeps on pushing all my buttons. It’s shockingly smooth, drenched with lovely caramel, toasted coconut, pear butter, cinnamon, treacle, and spice notes, and sports a LONG finish that fades gracefully and slowly. Made by a Cuban Rum Master who fled the island after Castro’s take-over, Ron Master Pedro Ramon Lopez Oliver, this is, in my book, one of the best inexpensive bottles of anything I’ve found in years. It will probably make a really dazzling cocktail but I’ll never know. I can’t stop just sipping it neat. Made by the same outfit that produced our amazing Ford’s Gin, profiled in yesterday’s reviews, Caña Brava hails from the Ron traditions of Panama and another emigre from castro’s Cuba, Francisco “Don Pancho” J. Fernandez. 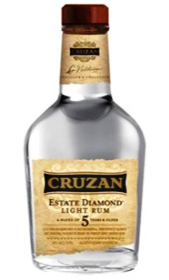 This is a Silver – or “Carta Blanca”, as it’s called in Central America – that’s made from cane and molasses and has a richness not usually found in other young Rums. This is a three year-old Blanco that’s mouth-coating and irresistibly smooth and balanced. The molasses provides some chewy, almost buttery texture and deep notes of white chocolate and vanilla cream and spices, all played against hints of citrus and nuts. This is a really fat Silver and shows amazing skill and judgment and wild potential as a mixer. 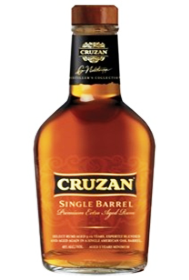 Cruzan (pronounced “CRU-shun”) is one of the oldest and most respected Rum producers in the Caribbean, opened in the early 1800s as an adjunct to the Nelthropp Family’s sugar cane plantation. The Cruzans are made from a molasses base and this Light testifies to it in a big way. The upfront freshness and vivid spices lead to a subtle intimation of tree fruits and slight tropical notes of coconut and banana. As a mixer, this is about as good as you’ll find in the Light Rum category, adding that earthy molasses grip without imposing its will on the drink. It’s light and lively on the palate and a Light that could easily be mistaken for a Golden in a blind tasting. This is substantial and sumptuous for just sipping or for fleshing out any of your fruit-based Rum drinks. Full disclosure: this sweet, very smooth concoction that announces itself as “Caribbean Rum with Natural Coconut Flavors” is actually made from Caribbean sugar cane that’s shipped to California and manufactured at the Mira Loma facility of Trinchero Estates, a large CA wine conglomerate. DON’T take that little bit o’ fessin’ up as a criticism. Sugar Island is a great bottle of mixing wizardry that’s a little too frankly sweet for me to just sip – although nowhere near as sweet and cloying as Malibu – but gives a gorgeous shot of coconutty flair to just about any cocktail you add it to. I invented one the first night after this bottle arrived; a combination of the William Wolf Pecan Bourbon (reviewed here recently) fresh cream, Vodka, bitters, and just a splash of Sugar Island. It was like a Mounds bar in liquid form and not as sweet as I had feared. This is like a very smooth and soulful coconut extract and it takes maybe a half-ounce to inject its charms into any mixed drink. Those with a real sweet tooth may very well sip it neat and it’ll work just fine that way, too. My oft-stated aversion to sweet and/or infused booze once in a while runs headlong into something Undeniable and this Sugar Island is just that. 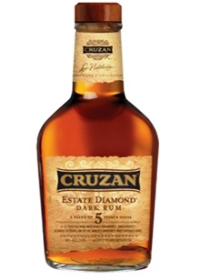 Cruzan Dark is made from 5 twelve year-old lots of Dark Rums aged in American oak barrels and blended just before bottling. It’s possibly THE workhorse Dark of the Virgin Island, where it’s produced and a very cost-effective way of adding great, deep Dark Rum flavor to cocktails without scorching your pocket-dwelling plastics. It’s roughly the color of a well-traveled penny; a rich, burnished copper and the color leads into a wonderful, chewy quality that starts with a jazzy blast of dark caramel and cafe au lait and builds quickly into toasted bread, burnt sugar, brickle, and baking spices. This is an immensely solid and flavorful Dark that wildly over-delivers on its price. 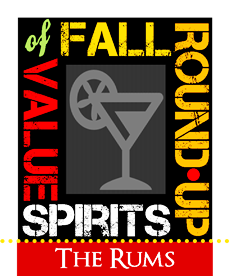 ← Fall Round-Up of Value Spirits: Booze Buys of The Year!